Only GRB has been able to design a faucet with a revolutionary system that evacuates in a simple and comfortable way, the water accumulated in the shower to avoid 100% the development of any type of bacteria. In addition, the Balnea series incorporates a surface in "Solid Surface" anti-scratch, which remains as new for years. Finally health, technology, beauty and durability come together in the form of taps. This product incorporates an innovative experience for the user, allowing simultaneous use of the shower head and the hand-shower. The central control allows you to perfectly control water temperature, maintaining it even in changes of pressure or simultaneous uses of water in the same house. The thermostatic cartridge has a rigorous C2 safety level, which prevents the user from selecting a temperature above 50º. GRB Balnea bets on the mixture of materials, maintaining the controls and the main structure in the now-traditional chrome finish, together with an innovative contribution in the sector, of a material like Solid Surface. The horizontal structure that houses the controls of this product allows the user to use the product itself as a shelf. This material allows its beauty to be preserved in spite of the passing of time, against any deterioration, as the surface can be repaired with fine sandpaper. 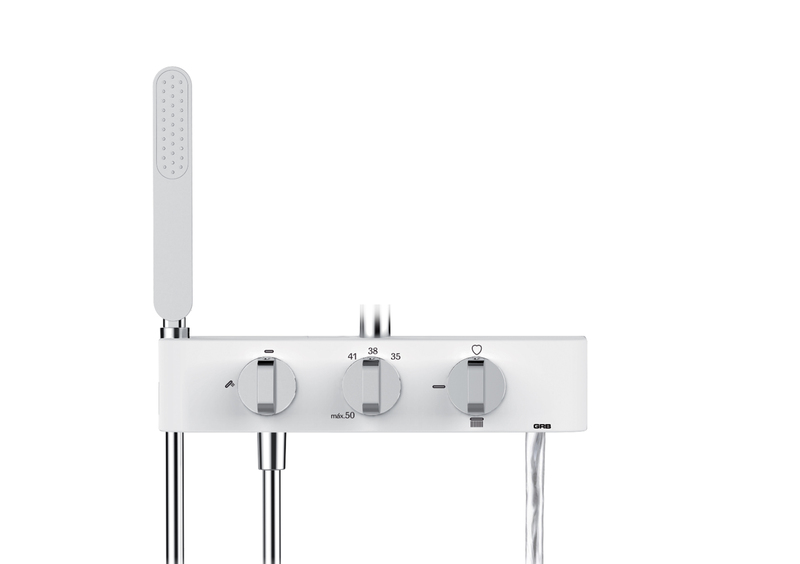 Adjustable bar that allows you to modify the location of the waterfall of the shower head. Perfect support to utilize the holes that we already have in the tiles without having to drill again. Sliding hand-shower holder, with a blocking system that allows its perfect use even with wet hands. Opening and closing the water tap is no longer enough. The user can open, shut off and drain the water, thanks to the recently patented 100% drainage system. Thus, we are able to empty the water that remains in the shower column between uses, preventing the appearance of possible bacteria produced by the standing water. Additionally, another big advantage provided by the option of emptying the column is completely avoiding any possible dripping of the shower column.